Bert Parks has returned to his post in front of the Sheraton Atlantic City Convention Center Hotel. First installed at the hotel in September 1998, the tuxedo-clad, life-size bronze statue of the late Miss America Pageant host holding the crown in his hands was welcomed with excitement then, and again Friday morning. 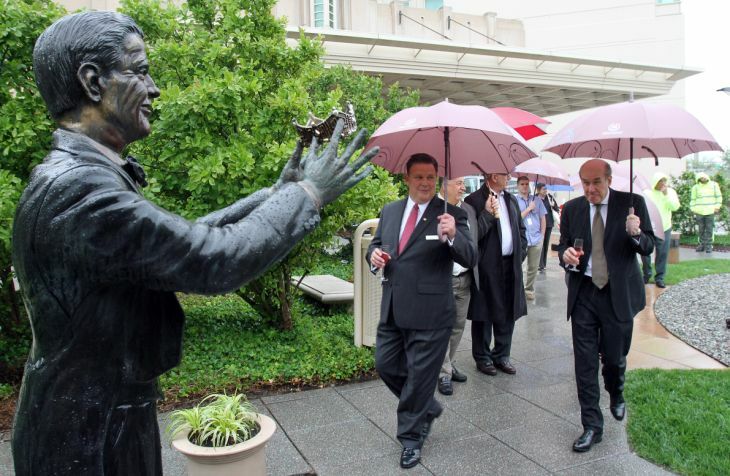 “People have such a warm affection for him, it’s as if he’s still here,” Sheraton developer Tom Scannapieco said as about 20 people with umbrellas crowded around the singing statue to toast its return. The 400-pound statue was wobbling and leaning in the tea garden outside the hotel in February, but no one knows exactly why, said Cathleen Kiernan, a spokeswoman for Sheraton. The pedestal base and fittings have since been repaired, she said. And so has the statue. 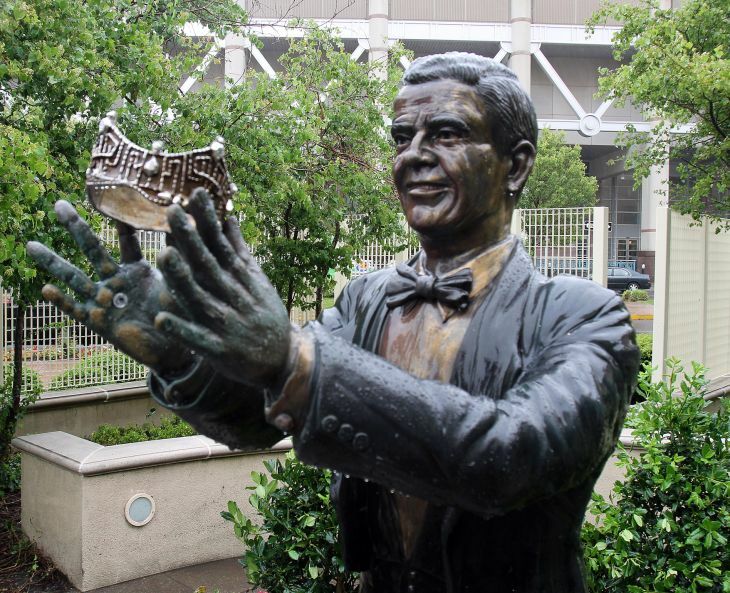 The bronze likeness of Parks was originally fitted with sensors in its palms, which would start a recording of him singing the traditional “There she is ...” from the song “Miss America” while people placed their heads under the crown. It had stopped working, but has been fixed with newer technology and digital speakers. “It’s Bert 2.0, if you will. ... He’s got a digital upgrade,” Kiernan said. Parks was pageant host from 1955 to 1979 and was often called Mr. Miss America. After he was fired in 1980 as the pageant sought to attract a younger audience, organizers invited him back to host the 70th anniversary in 1990. The grandeur of the pageant, which returns to Atlantic City in September, and the impact Parks had are still fresh in people’s minds, despite the fact that he died more than 20 years ago, Scannapieco said. Though fully “healed,” the operation of the sound, including timing and volume, are still in the works, Albrecht said. Right now, the song plays for about 40 seconds at a medium volume. Depending on the number of visitors and how long each stays in front of the statue for photos, the length and volume of the playback will be adjusted, he said.